« Can You Afford Not To Eat Organic? If April showers bring May flowers, what do April downpours bring? They bring lots of mud, but we covered the mud (and covered me in mud) a few posts back. Full Circle Farm received 4.3” of rain in the first week of April, exceeding the average of 4.1” for the entire month. At one point, I started looking for the ark, figuring Noah needed a few more animals. After I posted pictures of the water, my cousin in Wisconsin brought up our former drought. We have had some dry spells in the last couple of years and a bona fide drought in 2012 but, with 50+” of snow this winter and our wet beginning to spring, we’ve definitely recovered from our droughts. What this rain (and warmer temperatures) does appear to be bringing is some green pasture. It can’t come fast enough. The animals are getting tired of hay. Visit us at the Farm to Fork Market at Normandy Farms on Saturday, April 12. We have lots of eggs, pastured pork, and pastured chicken. Betsy’s Kitchen will be bringing granola, granola bars, and Paleo Almond Delight Bars. We are also introducing a new line of natural and organic body care products. 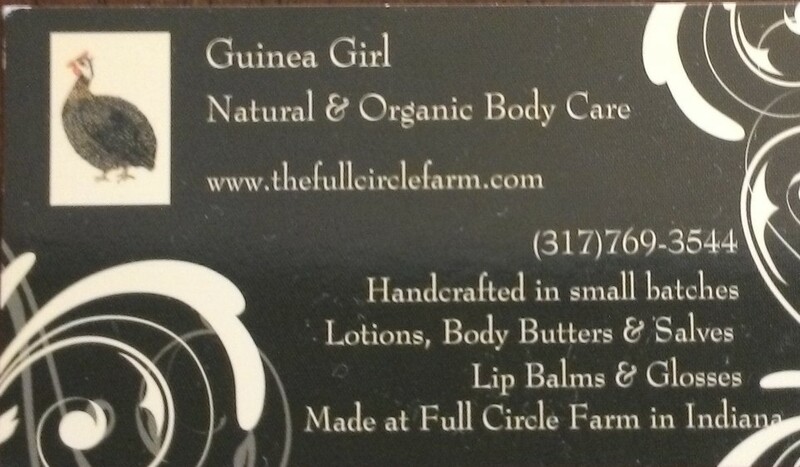 Come buy Guinea Girl lotions, body butter, herbal salves, and lip balms. The market is having a spring celebration this week. Join us all, including artisan vendors, for a silent auction, a mini-garage sale, and some organic seeds to start your home garden.